After leaving Stellenbosch University, Cape Town, Jonathan’s first role in the UK was with telecoms giant Carphone Warehouse, where he was awarded with the accolade of company’s top sales person. With his prize money, Jonathan was able to put down a deposit on a London flat and at the age of 22, became a landlord for the very first time. After further business development roles with both the Manpower Group and Northern Rock, it was his next business adventure that has had him working within the property sector ever since. Jonathan joined a chain of estate agents as a branch manager and during his tenure was promoted to Lettings Director with regional responsibility for the Lettings and Property Management department for over 20 offices. It was with this experience and his knowledge of lettings, that his career was sparked by his entrepreneurial spirit. 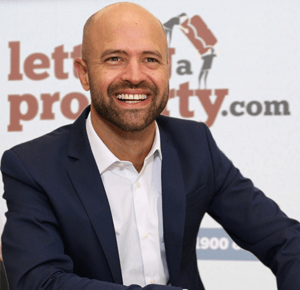 He realised an opportunity and carved out a market for landlords that wanted more control at a lower cost and hence Jonathan founded the online lettings agency, lettingaproperty.com. As a pioneer, founder and company director, Jonathan prides himself on being truly hands-on, putting his many years of industry and personal experience into good use. His relationships with industry peers, his customer service philosophy and his knowledge of systems upon which his business is built, has propelled Lettingaproperty.com to the forefront of Online Lettings in the UK.